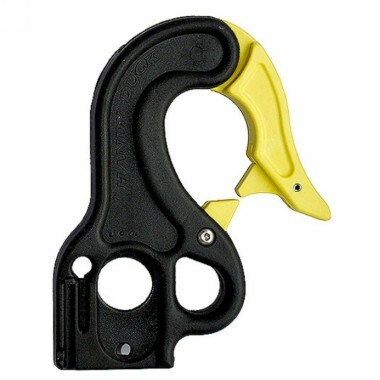 Mooring hook for all kind of docking. Grabs around max 33 mm spar. Handyduck works as a conventional snap-hook, but with the big difference that it is possible to release even when it is loaded. The principle is the same as that of the tow hook on a tugboat. If the vessel they are towing sinks, they must be able to loosen wire quickly even though they are under load. With Handydock the mechanism is never under load which means that we can release it any time. When using Handydock the boat hook is the tool to manover it.